I was recently invited to partake in a challenge. 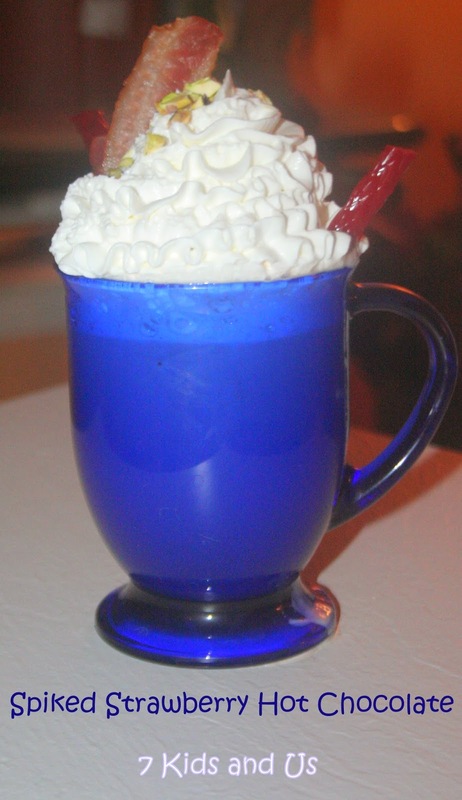 A challenge to create a yummy drink made with Captain Morgan White Rum. Two of my favorite bloggers were also participating, so I knew it would be a fun competition (check out their recipes here ThemeParkMama and WhoSaidNothingInLifeIsFree). I really wanted to do something for fall..since it's my favorite time of year and it's only a couple of weeks away, so I decided to make a hot chocolate. In a blender combine the rum and the Twizzlers. On the stove, heat the milk on medium heat until boiling, then add the Hershey's bar broken up into small pieces. Once the Hershey's bar has melted into the milk, turn off the heat and add the Captain Morgan White Rum with the Twizzlers. Let sit for 3-4 minutes to infuse the flavor of the Twizzlers. Using a mesh strainer, pour entire mixture through and into a cup, top with whipped cream, and garnish with Twizzler, bacon and chopped pistachios. The winner of the competition will be announced today by @captainmorgan .....wish me luck! !